A fast and efficient garden torch that is not just an expert weed killer but also converts to a shorter length, making it perfect for all types of home and garden uses - defrosting pipes, starting home fires or barbecues, it’s a perfect year-round tool. The ergonomic shape with soft, easy-grip TPE handle ensures it is easy to operate and the addition of conveniences such as Campingaz® exclusive Easy-Clic™ cartridge connection system and instant Piezo ignition means you be safely operating the torch in no time at all. The longer length is optimised for weed killing with a specially designed burner, high power, fully adjustable flame and longer tube length to easily attack more troublesome weeds, killing them fast. Optimised weed killing burner with a longer flame to cover a larger area. 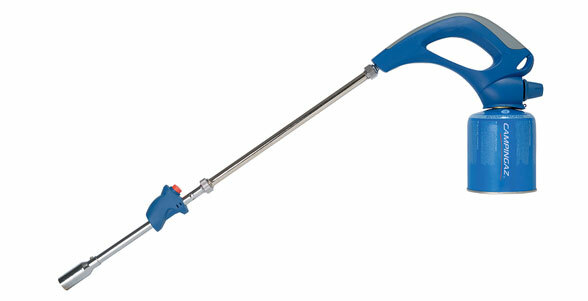 Soft TPE (thermoplastic elastomer) grip area in the handle provides comfort during use. The handle features a hole for easy hanging and is rigid to protect the internal construction. The CV garden torch range is fuel efficient.